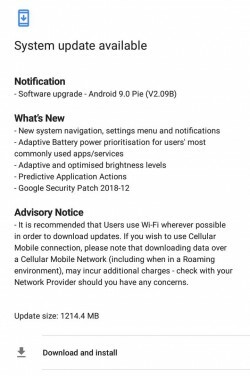 Today HMD Global started rolling out the update to Android 9 Pie for the Nokia 5.1 Plus. The company had promised that it would deliver the update by the end of the year, and it has kept its promise, if by just a few days. The new software is version V2.09B, arrives as a 1.2GB download, and it has the December 2018 security patch level included. You also get the new system navigation, Settings menu, and redesigned notification pane. Adaptive Battery prioritises your most commonly used apps and services and doesn’t allow those you only rarely use to eat up your milliamp hours. Adaptive brightness is an auto mode that learns from your manual adjustments over time, and apparently the initial brightness levels have been optimized too. Finally, with Pie you get predictive app actions. As usual, assume this to be undergoing a staged rollout, so don’t worry if you don’t see the update notification today. The update should reach you within the next few days.